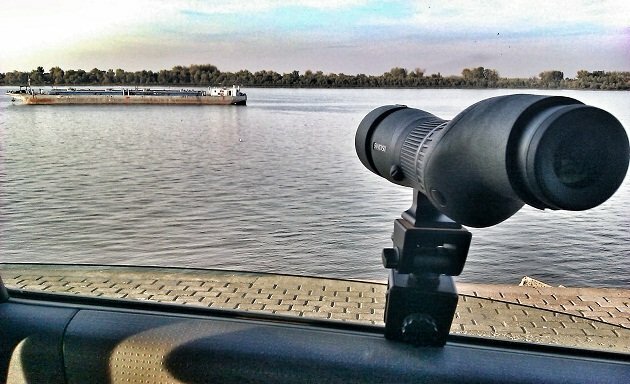 Down at the riverbank in Belgrade, I am mounting the scope onto the window clamp and making myself some coffee in a small water bottle, often used as an instant coffee shaker, while scanning the Danube water surface for gulls. One Pygmy Cormorant by the noisy group of Black-headed Gulls fighting over something edible carried downstream, a pair of Mute Swans by the other bank, widely scattered flock of Yellow-legged Gulls… Taking a sip of coffee and… one Lesser Black-backed Gull is among them. I am watching the Lesser Black-backed carefully and am no longer convinced… But if it isn’t an LBBG, it can only be the Great Black-backed Gull. 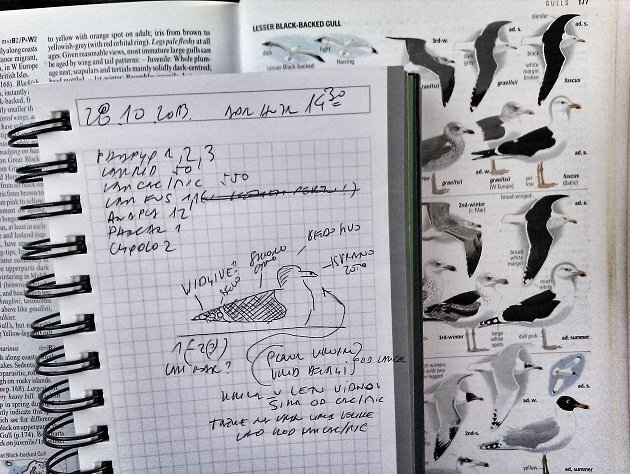 This bird differs from the Baltic race of the LBBG Larus f. fuscus by prominent white spots along the primaries, barely noticeable in Baltic gulls, and visibly larger head and heavy, broad flanks, when compared to Yellow-legged Gulls next to it. On the water, it does not appear longer, but does appear larger-headed and heavier than YLG. The Great Black-backed Gull is predominantly a sea gull, found in the ocean even 150 kilometers from coasts, and only rarely deeper inland in the continent. Hence, in land-locked Serbia, it has been recorded only three times: in 1857, one was shot at the Morava River; in 1993, one was observed by a bird photographer Rastko Aleksandrov at the Centa fish farm, north of Belgrade; and in 2012, a team of Croat and Serbian ornithologists found one at the Belgrade city rubbish dump. The rubbish dump lies a mere 8 kilometers from my present location and, as a curiosity, it was last year at this very spot that I found the sixth ever Pallas’s Gull (or Great Black-headed Gull) recorded in Serbia. Still, in recent decades, the Great Black-backed Gull has become a regular migratory and wintering wanderer of neighbouring Hungary and Croatia. Is it because the number of birds is increasing? Or the number of birders is increasing? Or better optics becomes more readily available? I started to bird this section of the river more regularly, making it my local winter patch, only after I’ve acquired the new Swarovski STX scope – the Danube is one thousand meters wide here and the new scope has opened an entire new world of birding for me! Whatever the reason, I will be coming back over the next few days to try to photograph the bird. While dismounting the scope, I realise that I have forgot the coffee altogether. If you’re not careful, they’re going to start calling you the Gull Man of Serbia! I’m ashamed to admit that as a geography nut, I wasn’t aware the Danube was that massive in it’s lower reaches. I see it has a huge, protected delta on the Black Sea as well. Now I suddenly want to bird Serbia, Bulgaria, and Romania! The Danube receives three larger tributaries and significantly increases in size in Serbia. Around Belgrade, it varies from 450 to 1100 yards, but some 45 miles to the east, it widens to two miles (I should go there again this winter, to search for my first Greater Spotted Eagle within Europe). Here are some photos of mine canoeing the Danube backwaters within Belgrade this spring. Thanks for sharing. It’s nice to see habitat like that within such a large city, even if there isn’t much of it left. The Syrian Woodpecker is wonderful. It was a wrong ID and not the Syrian – it was a bit atypical Great Spotted Woodpecker: it’s went is somewhat too pale and it’s facial markings are somehow “unfinished”, leaving the gap between the black cheek stripe and black on the nape, which all indicates Syrian, and yet, it has no streaked flanks (Syrian do have streaks) and has way too much white on outer tail feathers, which in the end indicated the Great Spotted. But the habitat is magnificent and I am fighting for it to receive official protection – which should happen in the next few years. Are You Going to Space Coast in 2014? Where Are You Birding This Third Weekend of March 2015?